This is probably the best short-change swindle every created. In his younger years, Devin Knight worked at a carnival doing Robert Nelson's Horoscope Pitch. During his stint with the carnival, he met a professional short-change artist, who showed him the most ingenious short-change scam Devin had ever seen. It made the scammer $10.00 every time he walked into a store and bought an inexpensive item. Devin was familiar with the sometimes crude short-change methods used by carnies, but he had never seen a swindle as sophisticated as this one. The scammer would very slowly and deliberately count the money in front of the clerk; everything looked more than fair and above board. Yet, despite this, he had just managed to swindle the store out of $10.00. He did this without any false counts or sleights. The scam was so deceptive, that the store wouldn't realize the shortage until the money was counted at the end of the day. One scammer, using this same scam took an entire block of stores for $10.00 each doing this. It is so deceptive, it flies by almost everyone. In Devin's words, "The misdirection is brilliant, and the handling is as clever as some magic tricks." Recently, at a street festival, Devin had a booth; a guy came up and tried to pull this scam on him, of course it failed, as Devin was wise to the scam. It was then and there that Devin decided to write an exposure of the swindle so as to protect others who deal with money and the public. If you are a merchant or work in a store, you are especially susceptible to this swindle, if you do not know what to look for. Very smart people are taken in due to the apparent innocence of the procedure. If you are a performer who does back of the room (BOR) sales, then you are susceptible. If you sell balloon animals or face painting to the public at festivals, then you too are susceptible. High unemployment, people needing to feed their families and pay bills has made this swindle spread to both large cities and small towns. No one is immune. You need to know how to protect your money from these scammers. This swindle is so easy, so fast and deceptive that some of you may wish to do it yourself and make a fast $10.00. Please don't do it, to do so is to commit a crime. This e-book was NOT written as a how-to-manual on how to be a short-change artist. Rather it was written to educate magicians and the public on how this swindle works, so they can protect themselves. This e-book provides step-by-step details on how the scam works, allowing you to spot an attempt to rip you off. Devin also shows you ways to thwart the swindle so it becomes dead in the water. This could be one of the most important e-books you read. Teach this to everyone you know, especially those that work in stores. Store managers should read this, then have an employee meeting letting everyone know how this scam works. You no longer have to be one of the fleeced. Become enlightened now. This is a must-read for any magician who loves reading about scams and swindles and how they work. This information is sold for educational only. Neither the author nor the distributor is responsible for the criminal misuse of this information. 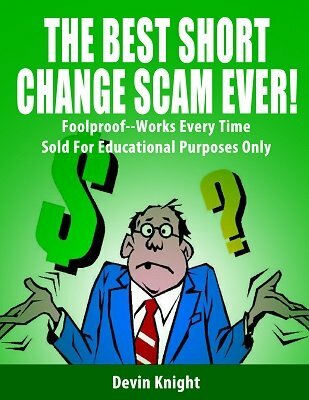 Recently came across Devin Knight's book about the short change scam. Being interested in this author's previous releases, this new one deals more with the area of deception, scams, cons and cheats. The book is short and quickly gets to the point. There is a lot of information out there on how to prevent the scam from happening, but most of it doesn't explain well enough. Devin not only breaks down the scam step by step, but also provide additional tips on how to protect yourself, as well as gives you an exercise to learn to spot it and prevent it from happening. If you - or know someone who - work/s at a shop, mall or related places, they need to know this information. The best way to counter the scam is to prevent it from happening and that's what this book is all about. Overall I would say it's pretty much worth reading and for only $7 picking this up is a no-brainer. If you've ever seen the movie The Grifters, you will see John Cusack do a version of the short change scam. As Devin reminds us, this ebook is for educational purposes only because if you pull this routine on a shopkeeper, you are stealing, plain and simple. I've seen it used exactly one time in my life, many years ago, so I'm sure that there still are some practitioners of this out there. This ebook should probably be required reading for anyone who works in retail or at charity events. The short change is an insidious flim-flam. This is really very well done. Devin first explains this scam in a way that that he plays the part of a scammer, and Devin’s writing fooled me and several other people - we would have lost money. Then he gives a clear unambiguous explanation of how the scam works, and Devin, in addition, gives good instruction on how to defend yourself from the scam by detecting that someone is attempting to pull it on you. This is necessary because several former storekeepers told me that they were once swindled by it, and that it is still practiced by scammers today. Good reading, and worth knowing.